I wrote last month about the quilts for all those affected by the horrific attack at the Pulse Nightclub in Miami. In that post, I vowed to make some heart blocks. But I changed my mind and decided to make a quilt instead. I know, I know, I should keep my promises. 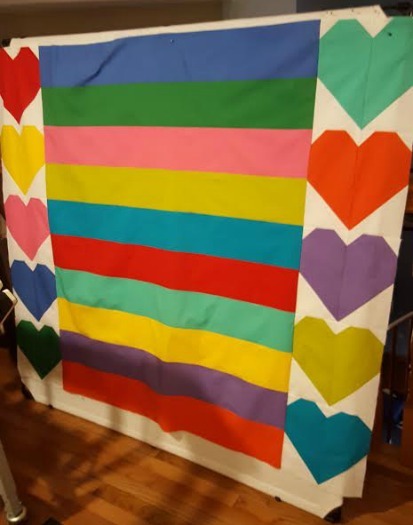 But let me tell you how I changed my mind and brag that my pulse quilt top is finished. The members of the Orlando Modern Quilt guild asked that everyone use the same tutorial from Cluck Cluck Sew. So I did! 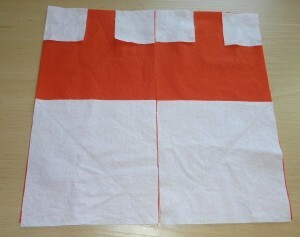 I cut two 10.5" by 5.5" rectangles from the red, four 2 inch squares and two 5.5" squares from the white. I drew a diagonal line on all the squares and lined them up on the red rectangles. At this point I realized she had a great tutorial. These blocks were easy. I sewed along all of the pencil lines. 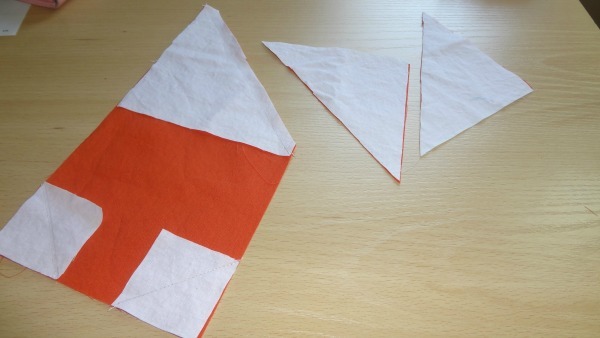 When I cut off the bottom part I realized these could be half square triangles with one quick seam. So I hung onto them. I trimmed all the extra white and pressed the two halves. I pressed the bottom up on one side and down on the other. That way, once I sewed the two parts of the heart together, it fit together better. Reducing bulk is always a challenge even in the easiest of blocks. I did some of the same sort of careful pressing at the top also. It will make the quilting easier. And ta-da, I had a heart block. Plus two half square triangles. Who knows what I will make with them. 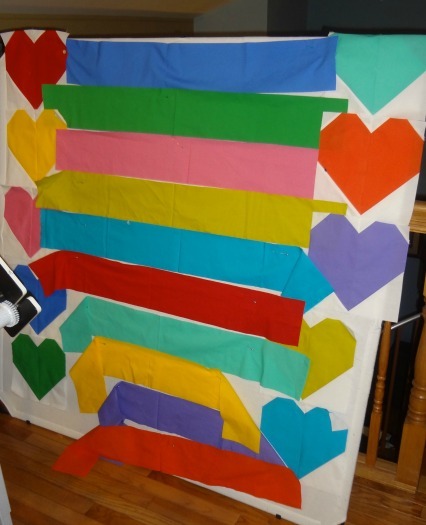 In the Orlando Modern quilt guild instructions, they requested low volume backgrounds. I was doing white. That's because I had bought all these gorgeous solids at Yoder's and even got the white. Before I knew it, I had three heart blocks. 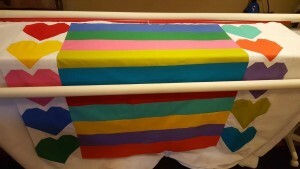 I saw pictures of the Orlando Modern Quilt guild with so many blocks to piece into tops and so many to quilt. I thought, oh what the heck, I will make the whole quilt. Plus I had this idea in my head floating around. I made a total of 10 heart blocks, each a different solid. I then cut one strip from each solid. The strips were five and a half inches wide and 40 inches long. I cut those in a jiffy. I put them up on my design wall and put the concept on Instagram. I got some positive feedback so I started piecing it all together. 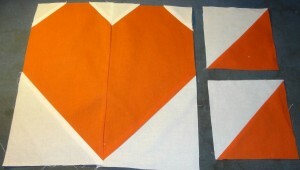 First I pieced both strips of hearts. Then I pieced the strips. I wanted to be careful with the strips so they didn't curve. I sewed down the first seam and then up the second. I did them in two groups of five, then I sewed those chunks together. No curves, yay! In a couple of hours, it was all put together. Next challenge or quandary: did I want borders? I again uploaded this picture to Instagram and posed the border question, should I add white borders? Everyone said NO. Hip hip hooray, less work for me! I sewed the back fabric together that I bought last Tuesday. 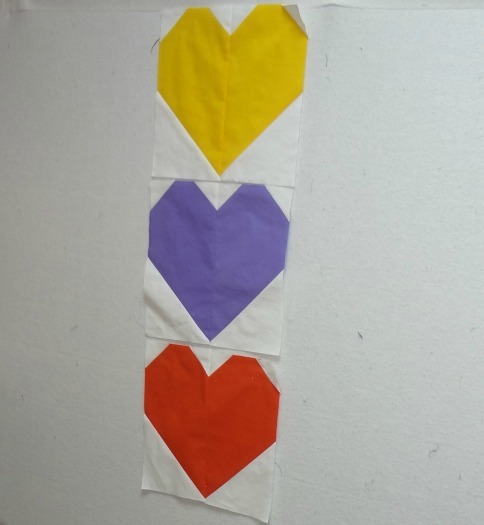 If you missed that heart fabric you can catch it here. I got it all loaded up on the Gammill. You know what I am going to wonder about next. Yep, how to quilt it. I think I have a pretty good solution. But let me try it out first and see if it works. That way if it doesn't, you'll never know! 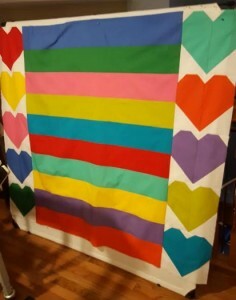 If you are interested in the blog posts from the Orlando Modern quilt you can find them here.